I have always collected fragments of stuff from everyday situations (all kinds kind of stuff - objects or pictures or sounds or words) so I can put them back together again in a new order to tell a new story. Thinking about what I might make for Artranspennine08 while crossing America by train and hearing fragmentary stories from my fellow passengers, I decided to use another coast-to-coast train journey, albeit the less dramatic one from Hull to Liverpool, crossing the Pennines between Leeds and Manchester. Lots of people use other people’s lives in their newspapers. The free Metro paper that many of them pick up at their local station seemed like a good place to make some transpennine art. And the motion of the train seemed, at least in part, to be a good thing to make it with. So, on Tuesday 15 July, I made a round trip using Transpennine Express trains from Leeds to Hull to Manchester to Liverpool and back to Leeds again. At each stop on the way I bought that day’s local newspaper, so I came back with the Metro, the Hull Daily Mail, the Manchester Evening News, the Liverpool Echo and the Yorkshire Evening Post. 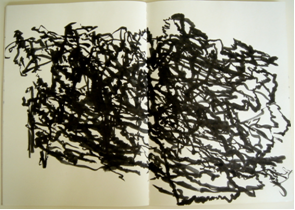 Throughout the six hours or so of my journey on the train I also made three drawings. 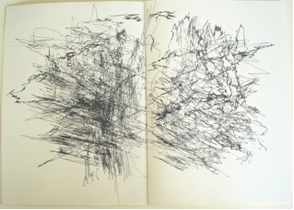 To do this I restaged a method first used by William Anastasi in the 70’s in his ‘Subway Drawings’ while travelling across New York on regular trips to play chess with John Cage. 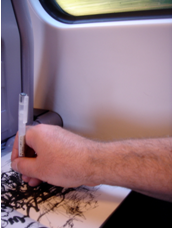 These ‘automatic’ drawings are a physical trace of my movement in a train seat travelling the transpennine corridor from coast to coast and back again. I selected some stories from the local papers I had collected and extracted a few words and phrases from them. Using a combination of randomising computer software and arbitrary decision-making of my own, this raw material was reconstructed into a poem. 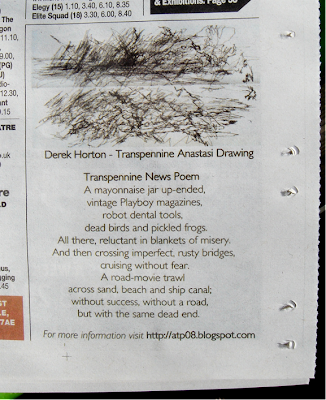 To return the work to its starting point in an attempt to catch the momentary attention of transpennine commuters reading their Metro newspaper, the poem and one of the drawings was inserted (by purchasing advertising space) in the Metro on Wednesday 13 August.